Willem Barentsz (Dutch pronunciation: [ˈʋɪləm ˈbaːrənts]; anglicized as William Barents or Barentz) (c. 1550 – 20 June 1597) was a Dutch navigator, cartographer, and Arctic explorer. He went on three expeditions to the far north in search for a Northeast passage. During his third expedition, the crew was stranded on Novaya Zemlya for almost a year. 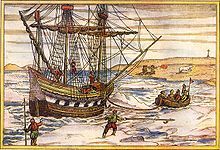 Barentsz died on the return voyage in 1597. In the 19th century, the Barents Sea was named after him. Willem Barentsz was born around 1550 on the island Terschelling in the Seventeen Provinces, present-day Netherlands. Barentsz was not his surname but rather his patronymic name, short for Barentszoon "Barent's son". A cartographer by trade, Barentsz sailed to Spain and the Mediterranean to complete an atlas of the Mediterranean region, which he co-published with Petrus Plancius. His career as an explorer was spent searching for the Northeast passage, which he reasoned must exist as clear, open water north of Siberia since the sun shone 24 hours a day, which he believed would have melted any potential ice. On 5 June 1594, Barentsz left the island of Texel aboard the small ship Mercury, as part of a group of three ships sent out in separate directions to try to enter the Kara Sea, with the hopes of finding the Northeast passage above Siberia. Between 23 and 29 June, Barentsz stayed at Kildin Island. On 9 July, the crew encountered a polar bear for the first time. After shooting it with a musket when it tried to climb aboard the ship, the seamen decided to capture it with the hope of bringing it back to Holland. Once leashed and brought aboard the ship however, the bear rampaged and had to be killed. This occurred in Bear Creek, Williams Island. Upon discovering the Orange Islands, the crew came across a herd of approximately 200 walruses and tried to kill them with hatchets and pikes. Finding the task more difficult than they imagined, they left with only a few ivory tusks. Barentsz reached the west coast of Novaya Zemlya, and followed it northward before being forced to turn back in the face of large icebergs. Although they did not reach their ultimate goal, the trip was considered a success. The following year, Prince Maurice of Orange was filled with "the most exaggerated hopes" on hearing of Barentsz' previous voyage, and named him chief pilot and conductor of a new expedition, which was accompanied by six ships loaded with merchant wares that the Dutch hoped to trade with China. Setting out on 2 June 1595, the voyage went between the Siberian coast and Vaygach Island. On 30 August, the party came across approximately 20 Samoyed "wild men" with whom they were able to speak, due to a crewmember speaking their language. 4 September saw a small crew sent to States Island to search for a type of crystal that had been noticed earlier. The party was attacked by a polar bear, and two sailors were killed. Eventually, the expedition turned back upon discovering that unexpected weather had left the Kara Sea frozen. This expedition was largely considered to be a failure. In 1596, disappointed by the failure of previous expeditions, the States-General announced they would no longer subsidize similar voyages – but instead offered a high reward for anybody who successfully navigated the Northeast Passage. The Town Council of Amsterdam purchased and outfitted two small ships, captained by Jan Rijp and Jacob van Heemskerk, to search for the elusive channel under the command of Barentsz. They set off on 10 May or 15 May, and on 9 June discovered Bear Island. They discovered Spitsbergen on 17 June, sighting its northwest coast. On 20 June they saw the entrance of a large bay, later called Raudfjorden. On 21 June they anchored between Cloven Cliff and Vogelsang, where they "set up a post with the arms of the Dutch upon it." On 25 June they entered Magdalenefjorden, which they named Tusk Bay, in light of the walrus tusks they found there. The following day, 26 June, they sailed into the northern entrance of Forlandsundet, but were forced to turn back because of a shoal, which led them to call the fjord Keerwyck ("inlet where one is forced to turn back"). On 28 June they rounded the northern point of Prins Karls Forland, which they named Vogelhoek, on account of the large number of birds they saw there. They sailed south, passing Isfjorden and Bellsund, which were labelled on Barentsz's chart as Grooten Inwyck and Inwyck. The ships once again found themselves at Bear Island on 1 July, which led to a disagreement between Barentsz and Van Heemskerk on one side and Rijp on the other. They agreed to part ways, with Barentsz continuing northeast, while Rijp headed due north. Barentsz reached Novaya Zemlya on 17 July. Anxious to avoid becoming entrapped in the surrounding ice, he intended to head for the Vaigatch Strait, but became stuck within the many icebergs and floes. Stranded, the 16-man crew was forced to spend the winter on the ice, along with their young cabin boy. After a failed attempt to melt the permafrost, the crew used lumber from their ship to build a 7.8×5.5 metre lodge they called Het Behouden Huys (The Saved House). Dealing with extreme cold, the crew realised that their socks would burn before their feet could even feel the warmth of a fire – and took to sleeping with warmed stones and cannonballs. In addition, they used the merchant fabrics aboard the ship to make additional blankets and clothing. The ship bore salted beef, butter, cheese, bread, barley, peas, beans, groats, flour, oil, vinegar, mustard, salt, beer, wine, brandy, hardtack, smoked bacon, ham and fish. Much of the beer froze, bursting the casks. By 8 November Gerrit de Veer, the ships carpenter who kept a diary, reported a shortage of beer and bread, with wine being rationed four days later. In January 1597, De Veer became the first person to witness and record the atmospheric anomaly known as the Novaya Zemlya effect. Proving successful at hunting, the group caught 26 Arctic foxes in primitive traps, and killed a number of polar bears. When June arrived, and the ice had still not loosened its grip on the ship, the scurvy-ridden survivors took two small boats out into the sea on 13 June. Barentsz died at sea on 20 June 1597, while studying charts only seven days after starting out. It is not known whether Barentsz was buried on the northern island of Novaya Zemlya, or at sea. It took seven more weeks for the boats to reach the Kola Peninsula, where they were rescued by a Dutch merchant vessel commanded by former fellow explorer Jan Rijp. By that time, only 12 crewmen remained. Ultimately, they did not reach Amsterdam until 1 November. Sources differ on whether two men died on the ice floe and three in the boats, or three on the ice floe and two in the boats. The young cabin boy had died during the winter months in the shelter. The wooden lodge where Barentsz' crew sheltered was found undisturbed by Norwegian seal hunter Elling Carlsen in 1871. Making a sketch of the lodge's construction, Carlsen recorded finding two copper cooking pots, a barrel, a tool chest, clock, crowbar, flute, clothing, two empty chests, a cooking tripod and a number of pictures. Captain Gunderson landed at the site on 17 August 1875 and collected a grappling iron, two maps and a handwritten translation of Pet and Jackman's voyages. The following year, Charles L.W. Gardiner also visited the site on 29 July where he collected 112 more objects, including the message by Barentsz and Heemskerck describing their settlement to future visitors. All of these objects eventually ended up in the Rijksmuseum Amsterdam, after some had initially been held in The Hague. The amateur archaeologist Miloradovich's 1933 finds are held in the Arctic and Antarctic Museum in St. Petersburg. Dmitriy Kravchenko visited the site in 1977, 1979 and 1980 – and sent divers into the sea hoping to find the wreck of the large ship. He returned with a number of objects, which went to the Russian Arkangel's Regional Museum. Another small collection exists at the Polar Museum in Tromsø. In 1992, an expedition of three scientists, a journalist and two photographers commissioned by the Arctic Centre at the University of Groningen, coupled with two scientists, a cook and a doctor sent by the Arctic and Antarctic Research Institute in St. Petersburg, returned to the site, and erected a commemorative marker at the site of the cabin. The location of Barentsz' wintering on the ice floes has become a tourist destination for icebreaker cruiseships operating from Murmansk. Memorial to Barentsz in Vardø, Norway. Two of Barentsz' crewmembers later published their journals, Jan Huyghen van Linschoten who had accompanied him on the first two voyages, and Gerrit de Veer who had acted as the ship's carpenter on the last two voyages. 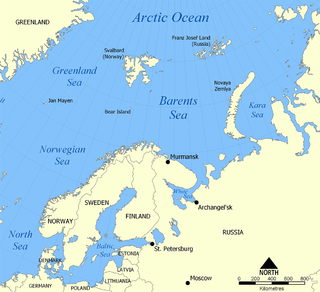 In 1853, the former Murmean Sea was renamed Barents Sea in his honour. Barentsburg, the second largest settlement on Svalbard, Barentsøya (Barents Island) and the Barents Region were also named after Barentsz. In the late 19th century, the Maritime Institute Willem Barents was opened on Terschelling. In 1878, the Netherlands christened the Willem Barentsz Arctic exploration ship. In 1931, Nijgh & Van Ditmar published a play written by Albert Helman about Barentsz' third voyage, although it was never performed. In 1946, the whaling ship Pan Gothia was re-christened the Willem Barentsz. In 1953, the second Willem Barentsz whaling ship was produced. A protein in the molecular structure of the fruit fly was named Barentsz, in honour of the explorer. Dutch filmmaker Reinout Oerlemans released a film called Nova Zembla in November 2011. It is the first Dutch 3D feature film. In 2011, a team of volunteers started building a replica of Barentsz' ship in the Dutch town of Harlingen. The plan is having the ship ready by 2018, when the Tall Ships' Races will visit Harlingen. ^ a b c d "Historic expedition led by Willem Barentsz nears 400th anniversary". Retrieved 8 December 2007. ^ De Veer, Gerrit (17 July 2017). "A True Description of Three Voyages by the North-east Towards Cathay and China: Undertaken by the Dutch in the Years 1594, 1595 and 1596". Hakluyt Society. Retrieved 17 July 2017 – via Google Books. ^ a b c d e "God and the Arctic survivor". New Scientist. April 1993. ^ Alexander, Philip Frederick. The North-west and North-east passages, 1915. ^ Mirsky, Jeannette. "To the Arctic! : The Story of Northern Exploration from Earliest Times", 1997. ^ a b c Synge, J.B. (c. 1912). A Book of Discovery. ^ a b c d e De Veer, Gerrit. "The Three Voyages of William Barentsz to the Arctic Regions" (English trans. 1609). ^ a b c d e De Peyster, John Watts. The Dutch at the North pole and the Dutch in Maine. 3 March 1857. ^ "The Northern Lights Route - Willem Barentsz". www.ub.uit.no. Retrieved 17 July 2017. ^ Beechey, F.W. "A Voyage Of Discovery Towards The North Pole, In The Majesty's Ships", 1843. ^ Van Der Werf, Siebren Y. (November 1997). "Astronomical Observations During Willem Barents's Third Voyage to the North" (PDF). Arctic. 51 (2). doi:10.14430/arctic1055. ^ Scoresby, William. "An Account of the Arctic Regions", 1820. ^ a b c d Hacquebord, Louwrens (September 1995). "In search of Het Behouden Huys: a survey of the remains of the house of Willem Barentsz on Novaya Zemlya" (PDF). Arctic. 48 (3). CiteSeerX 10.1.1.505.5702. doi:10.14430/arctic1246. ^ "Homage to Gerrit de Veer". Retrieved 7 December 2007. ^ American Antiquarian Society, "Transactions and Collections", 1860. ^ Goorich, Frank Boott. "Man Upon the Sea", 1858. ^ De Jonge, J.K.J. "Nova Zembla: De voorwerpen door de Nederlandsche Zeevaarders na hunne overwintering aldaar in 1597 achtergelaten en in 1871 door Kapitein Carlsen teruggevonden, beschreven en toegelicht. ", 1872. ^ Braat, J. (December 1984). "Dutch Activities in the North and the Arctic during the Sixteenth and Seventeenth Centuries" (PDF). Arctic. 37 (4). doi:10.14430/arctic2229. ^ Chisholm, Hugh, ed. (1911). "Barents, Willem" . Encyclopædia Britannica (11th ed.). Cambridge University Press. ^ "Nordic Travel". Archived from the original on 29 August 2007. Retrieved 29 August 2007. ^ "Quark Expeditions". Archived from the original on 15 October 2008. Retrieved 17 July 2017. ^ "MIWB - NHL Hogeschool. Vergroot je perspectief". www.miwb.nl. Retrieved 17 July 2017. ^ Bruijne, Antonius de; Balje, Bastiaan Gerardus (1985). De eerste tocht van de Willem Barentsz naar de Noordelijke IJszee 1878. ^ Boot, W.J.J. (1987). De Nederlandsche Maatschappij voor de Walvischvaart. Amsterdam: Bataafsche Leeuw. ISBN 978-90-6707-129-1. Hopen is an island in the southeastern part of the Svalbard archipelago (Norway). Hopen was discovered in 1596 by Jan Cornelisz Rijp during the third expedition by Willem Barentsz, trying to find the Northeast Passage. Later, in 1613, its name was given by Thomas Marmaduke of Hull, who named it after his former command, the Hopewell. Sir Hugh Willoughby was an English soldier and an early Arctic voyager. He served in the court of Henry VIII and fought in the Scottish campaign where he was knighted for his valor. In 1553 he was selected by a company of London merchants to lead a fleet of three vessels in search of a northeast route to the Far East. Willoughby and the crews of two ships died on the voyage while the third vessel went on to open a successful and long-lasting trading arrangement with Russia. Jan Huyghen van Linschoten was a Dutch merchant, trader and historian. An alternative spelling of his second name is Huijgen. Jacob van Heemskerk was a Dutch explorer and admiral. Cornelis Corneliszoon Nay was a Dutch navigator and explorer who attempted to discover the Northeast Passage from Europe to the Far East. Maria Vasilyevna Klenova was a Russian and Soviet marine geologist and one of the founders of Russian marine science and contributor to the first Soviet Antarctic atlas. Gerrit de Veer was a Dutch officer on Willem Barentsz' second and third voyages in search of the Northeast passage. De Veer kept a diary of the voyages and in 1597 was the first person to observe and record the Novaya Zemlya effect, and the first westerner to observe hypervitaminosis A caused by consuming polar bear liver. A false sunrise is any of several atmospheric optical phenomena in which the Sun appears to have risen, but is actually still some distance below the horizon. A number of different atmospheric conditions can be responsible for this effect, all of which divert the sunlight in such a way as to allow it to reach the observer's eye, thereby giving the impression that the light comes directly from the Sun itself. The spread of light can sometimes be deceivingly similar to a true sun.